Many times, the hobby is about the little things. This is literally the case for 2015 Topps Mini Baseball Complete Set. Shrinking the flagship set down, the factory release is an online exclusive. Celebrating the 40th anniversary of the original mini product from Topps, 1975 Topps Mini Baseball, the 2015 mini factory set includes miniature versions of the Series 1 and Series 2 base sets, totaling 700 cards. Collectors can find 11 parallels, numbered to ten or less, in each set. Options include Black (#/10), Red (#/5) and Gold (1/1). Although Topps Mini Baseball has been seen for the past several years, the 2015 edition forgoes the traditional pack format for a factory set with some extras. With a retail price of $100, the product releases exclusively on Topps' online store Monday, November 16. The exact production was not provided, but Topps revealed that it will be less than 1,000 sets. The small cards are printed on 16-point card stock. Collectors more interested in full-size sets can check out the standard factory set or another online-only set in the form of 2015 Topps Limited Baseball. 2015 Topps Mini Carlos Correa 1975 Design Rookie MINT Rare! 2015 Topps Mini Carlos Correa 1975 Design Rookie GEM MINT SGC 10 Rare! 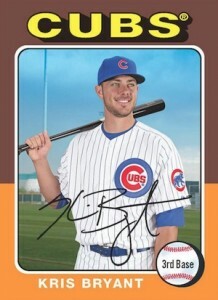 2015 Topps Factory Set Baseball Hobby (Box) - Kris Bryant RC!